2001 Art and Health: Dyan Marie developed an art and heath program for heath care facilities and applied it to a hospital-wide program at Oshawa General Hospital. The project improved the hospital’s atmosphere and worked to link the hospital to the city at large. She created and managed art projects for seven hospital wards, corridors, lobbies and parkland. Dyan Marie created photo-based artworks for the Hospitals isolation floor and Mother Child facility. She commissioned Robert Burley, Richard Rhodes, Geoffrey James and others to create responsive photography projects, researched and developed specifically for hospital wards and for the hospital’s public spaces. In a related effort to connect the hospital to city institutions, Dyan Marie curated an exhibition with artist Geoffrey James for the Robert McLaughlin Gallery and produced a catalogue. • offer meditative places to help calm, focus and build strength. Geoffery James has produced a series of photographic images based on the walkways, parks and retreat locations in the Oshawa area. One intention of the artwork is to introduce a new way of looking at local landscapes that recall the viewer’s own neighbourhood. The beauty and importance in the familiar sites hopes to empower the viewers with a similar recognition of their own lives. Works have been installed on the In-patient Surgery Floor, 6G, July 30, 2000 and will be installed on the Oncology Care floor, 6F, January 22, 2001. The images were also be featured as an exhibition at the Robert McLaughlin Gallery . A catalogue was produced with images from the exhibition and statements by the artists, Lakeridge Health Corporation/Oshawa and the Robert McLaughlin Gallery and ARTATWORK. Opened March 2001 in partnership with Lakeridge Health Corporation/Oshawa. Dyan Marie’s Art and Healing project for Lakeridge Health Corporation responded to a long cross-cultural traditions of giving flowers to express empathy and goodwill. She created digitally developed photographs exploring close views of brilliantly coloured flower images each seeded with tiny single word poems. The nearly hidden words offer up a frame of mind beyond questions of ambition, action or will and find a calm middle ground between passion and passivity. The work is installed in an isolation floor. 9 Main in the elevator area, the central corridor and in patient rooms. Garfield Ferguson “ BENEATH THE SURFACE”. Garfield Ferguson’s paintings are based on reflective observations of water flowing over stones. The blue depths of the paintings evoke images of peaceful streams, of swaying water plants and of fossils etched as enduring records in time. This work is installed in the patient’s lobby on 9 Main. Robert Burley created a series of images exploring the idea of shorelines. In them, one can imagine listening to the sound of water or perhaps walking into it. The imagery is intended to offer a soothing imaginary venture. The water theme also evokes a primordial world of beginnings. This work is to be installed in the Mother and Baby Floor, 4F, in the patient rooms, Feb 28, 2001. Richard Rhodes’ photographs of skies offer an illustration of changing light, atmosphere and evolving airborne cloud forms. Individual images offer expansive, meditative pictures that trace the movement of continental air over our heads. This work is to be installed in the corridors of the Mother and Baby Floor, 4F, and in patient rooms of the In-patient Rehabilitation Floor, 5F, Feb 12, 2001. Working with the Robert McLaughlin Gallery archival images collection, which includes the Thomas Bouckley Collection of Historical Photographs, artists create a long-minded view of Oshawa’s changing landscape. 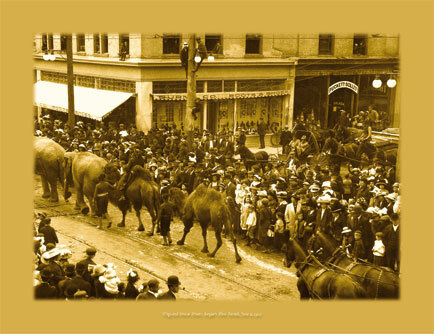 Images were researched, reconstructed and designed as a series of pictures examining the events and daily life of Oshawa in the early 1900’s. Doris McCathy water colour images continue the Group of Seven’s Canadian view of the landscape. Installed in the rooms of the Continuing Care Floor, 3F, March 12th, 2001. Pedie Wolfont’s large-scale paintings are highly-coloured, semi-transparent, overlaid blocks of colour. The effect is as if colours and light were continually coming up to the surface of the image. They reference, fall leaves on a forest floor, light reflected on the surface of water, shadows cast from coloured glass windows. Installed in the south infill, Summer 2001. A gallery site is being created for the redeveloped Lakeridge Health Corporation. The intention of providing this exhibition space includes; offering a stimulating destination for patients out for a walk; building a bridge between the hospital and the local Oshawa community; enhancing the hospital environment by becoming an active cultural contributor; offering staff, patients and family of patients changing art exhibitions with content intended to soothe, calm and help heal. In Planning: A number of short films are being planned for broadcast on the Lakeridge Health Corporation Television Channel. These films will feature discussions and imagery by the artists producing work for Lakeridge Health Corporations’ Art and Healing Programs. The content will focus on opening up “ways of seeing”. Additional art related projects include: a Donor Recognition Project by Lynda and Ron Baird now located in the entrance area. In development is a Garden for the Lakeridge Health that will feature a sculpture by Eldon Garnet. BACKGROUND In September 1997, Dyan Marie, ARTATWORK and Lakeridge Health Corporation / Oshawa introduced a discussion to consider ways of create a better healing atmosphere for their patients. The following notes list concerns and idea start-up points that developed into an art and healing program implemented throughout the hospital. INTRODUCTION The redevelopment of Lakeridge Health Corporation offers the opportunity to explore one major goal hospital’s are meant to achieve; to be healers.Taking into account changing issues and perceptions about priorities – about what is financially reasonable and efficient, as well as the best ways of being helpful. Deciding what is important is always a challenge. Reflecting a healing atmosphere for patients, families of patients, and staff is not only an important symbol for hospitals; it can help create an atmosphere that promotes healing in its own right. The following explores ways a visual art program can contribute toward creating an atmosphere that reflect and promote Lakeridge Health Corporation’s goals. CONSIDERATIONS Hospitals, places of fear and hope, fueled by stories read in the press, seen in movies and TV, and that are told by relatives and friends. Stories of dramas played out as outstanding life saving practices, but others of oversight and wrong practice with tragic results. Information about health in both conventional and alternative practices offer endless new discoveries, confirming or contradicting what we thought we knew. We are asked to believe any number of extreme things about our health: that we can heal ourselves; that prayer helps; that chemotherapy is the solution; that mastectomy is or is not the answer. The patient is inundated with conflicting health information. There are few assurance that the medical professional has one prefect answer. Adding to this confusion, the hospital patients have been separated from the support and regular rhythms of their lives, removed from loved ones, home, work or school. In daily practice people allow their bodies to be touched only by those that they trust and love. Respect and control of personnel space is a prerequisite for normal levels of comfort. As a hospital patient, regular ideas of personal space must be set aside. It may be necessary to be willingly tested, probed, hurt in the hands of strangers. The level of stress generated by these situations can be overwhelming. The calmer and more comfortable we make patients the less stress they suffer. The result is more co-operation and motivation toward helping in the process of their own healing. Families The better hospitals support families of patients with a positive atmosphere, the better families can focus on being supportive of their hospitalized family member. Staff The more engaged and motivated hospital staff are, the better and more caring they can perform their professional duties. Achieving a less stressful, more comfortable and engaged environment helps maximize both human potential and cost effectiveness. A better environment improves the basic quality of life, resulting in more effective and efficient health care. • generating a response from the patient and their families, be it: comfort and trust, or fear and anxiety.